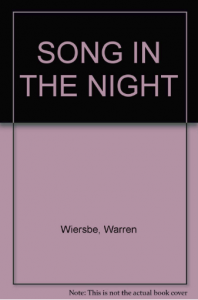 I have grown to love the writings of Warren Wiersbe. Wiersbe pastored Calvary Baptist Church in Covington, KY, and then Moody Memorial Church in Chicago from 1971 to 1978. He is well known as a speaker and writer. I find it interesting that Wiersbe speaks in a way similar to Moody himself and previous pastors of that great church such as H.A. Ironside, A.C. Dixon, and R.A. Torrey. All of these men are (were) capable of indepth teaching which they often did, especially in their writings, but all of them had a very practicle way of preaching from the pulpit. I am for both methods, but, as a pastor, I am often convicted over the power and influence these pulpiteers had with God’s Word. This book is no exception. After reading a number of books this year on God and how we can know Him, reading this little book was a breath of fresh air. It contains 30 messages that Wiersbe preached at Moody Church which were later printed (my copy is dated 1973). An easy read and a blessing.